1. Set the Base URL to "http://www.google.com". 3. Pause for 5 seconds. 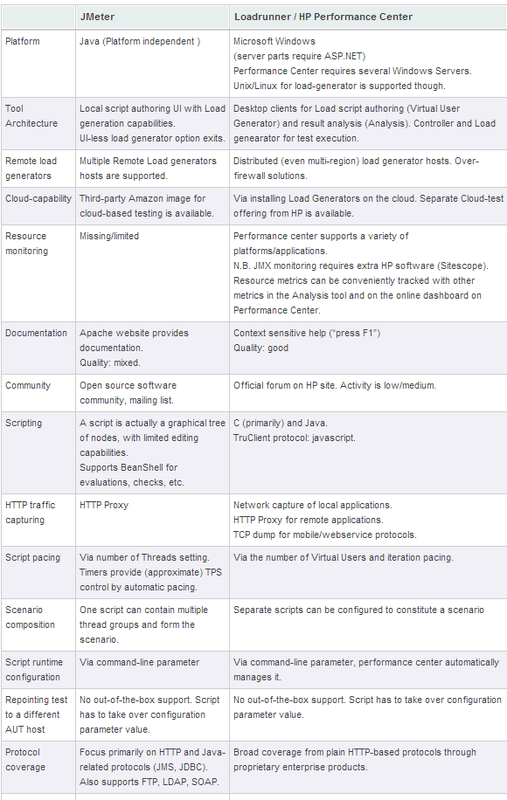 In current industry, LoadRunner(Paid) and Jmeter(Open Source) are two well known tools for performance testing. 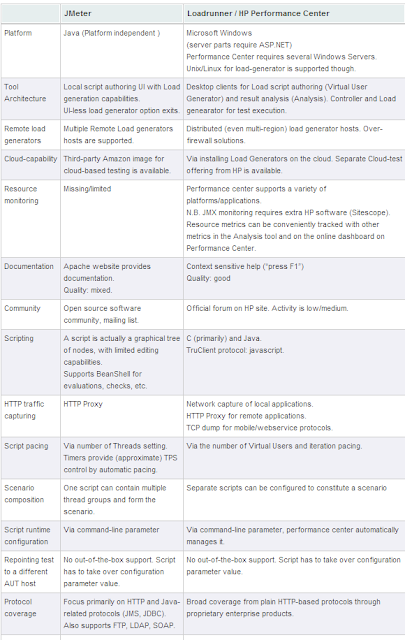 I got this image from net comparing both tools on various basis. Hope it will help to understand the difference. This is the phase where business and technical requirements are identified and gathered. Here the team sends the Requirements gathering questionnaire to the client for asking test requirements, H/w and S/w requirements. 1. SLAs (Service level Agreements). Here a document is provided as a template for this. In this phase the test is planned and designed. Planning is mostly about the Test environment setup as per application, work load profile and H/W. Test design is mostly about types of tests to be conducted, Number of Users, schedule, Execution plan, Scripts to recorded, Data, Scripts enhancements, metrics to be measured. In Most of the organizations they follow a single document as Test plan/design. Below mentioned are the sections to be included. Before going for performance testing, the test environment (S/W & H/W) should be ready and the scripts should be developed. The test scripts are developed based on the protocol and base scripts are scripted. Once base scripts are captured, they should be enhanced by performing Correlation (For dynamic value handling), Parameterization (Substitution of values), function and custom functions to meet the requirement. Once they are enhanced they should be validated against 1 user (Perform single user run) and reviewed and should be base lined. The base lined scripts should be used for test execution. The output of this phase should be scripts and the performance test isolated environment. 1. Decide the test (Load/stress/endurance) and number of users. 2. Ramp up, duration and Ramp down pattern. 3. Workload profile, run time settings and upload scripts. 4. Apply the details and set the monitors to measure the metrics. 5. Start run and perform online monitoring. Outputs of this phase are Test results and Test logs. During this phase the test results and logs are analyzed for identifying bottlenecks and performance issues. Results are compared with SLAs for all types of metrics and verify whether results met SLAs or not. If results are not met SLAs, raise performance defects and analysis what is causing that problem and report. Preliminary test report is prepared shared across. A template is provided here as attachment. For the reported performance bottlenecks /issues engineering team acts and tunes the application and reengineers it wherever required. For the tuned application Step 4 Test execution is performed until application meets expected SLAs. For the analyzed results an executive summary report is prepared with the following and sent across respective stake holders. 1. Client metrics (Response times, throughput, hits/sec, pages/sec e.t.c) statistics and graphs. 2. Server and resource metrics statistics and graphs (RAM Disk, Processor, NW and App, Web, DB server metrics). 7. Comparisons of results for various tests.